He was kicked, dragged, stoned and spat on. And thus the fate of yet another Ugandan soldier whose corpse was left to rot in Mogadishu’s notorious Baar Ubax junction was sealed. 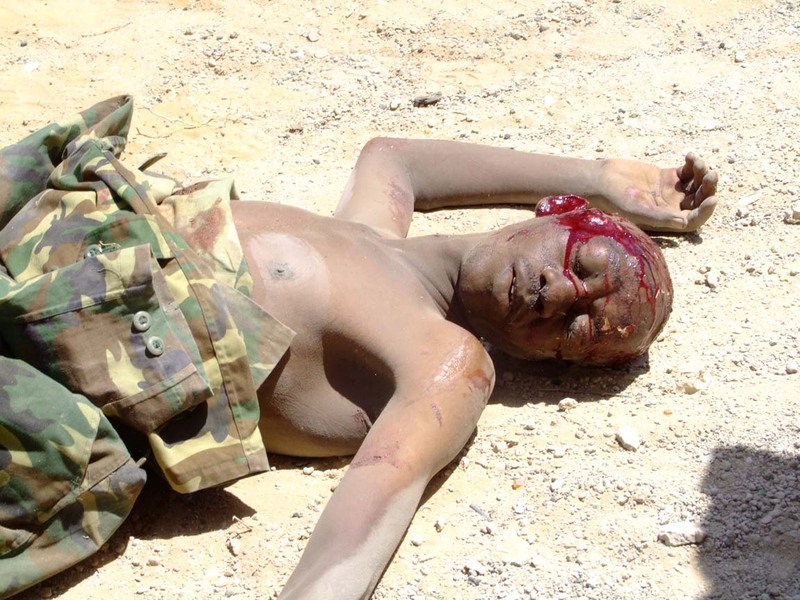 The unidentified soldier, complete in his military gear, was last night captured by Al-Shabab fighters in Mogadishu’s Northern district of Boondheere after a fierce gun battle took place between the forces. It is the third day of intense battles in the capital and the death toll is also increasing. Bakara market, the city’s busiest, has been under constant shelling and the number of innocent civilians thought to have been killed there has risen sharply. PM: Oh God! how much longer can I bear this? I can’t bear sitting next to this…! PM: Greedy bast’rd! he even finished his plate before everyone and now he is eyeing the bananas. Ok – put way this plate – I am the bigger man here. At least the world sees me that way since I officially decided to resign for the good of my country and people. I will be a hero! A hero! Of course they don’t know anything about my settlement Duh! President: Good riddance! 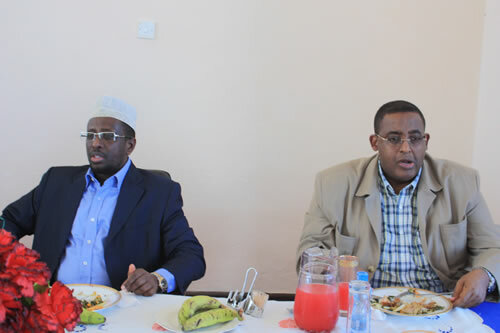 now you can talk all you want about a cabinet reshuffle in Puntland! or even join your boys in Galgala – I know you are all the same. Sharif Hassan: Feel a lot better now don’t you Mr President? 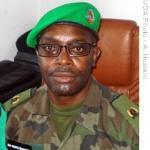 Sharif Hassan: Very well Sir! Very well indeed…you need not worry about anything Sir! For the last few weeks, and the last few days in particular, Mogadishu has been in mired in disarray. The curtains of confusion have been raised and the residents here were entertained to a remarkable show: a political tug of war between the Somali President and his Prime Minister! 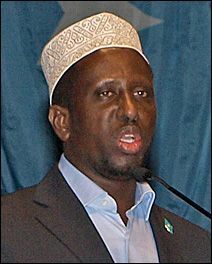 In a bitter dispute that is threatening to break up the Somali Transitional Federal Government (TFG), the Somali President, Sheikh Sharif Sheikh Ahmed, called on lawmakers to pass a ‘vote of no-confidence’ regarding the Prime Minister, Omar Abdirashid Ali Sharmarke, in order to bring about a ‘change’ that would propel the government in the ‘right direction.’ In turn the Prime Minister, who is vehemently opposed to the President, denounced the attempts by the president as ‘nonsensical,’ stating that there was no need for changing the existing structures of the government. Indeed, the banality of the political landscape in Mogadishu has received its much-awaited makeover with a squabble at the highest level. Amid the upheaval, the members of the parliament, with a 296 out of 300 majority, passed a motion last Thursday calling on the government to appear before the Parliament for a vote of confidence on Saturday in order to stay functioning. The Prime Minister, who decried the decision of the parliament, must win up to 276 votes of confidence in order to retain his position, otherwise he leaves empty handed. In this whirligig of Somali politics, however, it appears that the session was cancelled today due to reasons not revealed to the media and when a group of angry MPs decided to stage their own parliamentary session, AMISOM forces have managed to disperse them by force. Somaliland Press:- In one of its rarest occasions, the city of Mogadishu today felt like a city of peace and calm rather than the deadly war zone that it has become renowned for over the last few decades. The thunderous roar of mortars and rockets and the rapid exchange of gun fire remained eerily muted this morning, and as if to honour the blessed occasion of Eid, the city remained silent. The frequently pounded Bakara market, though still healing from yesterday’s heavy shelling, closed its doors to business and public and a steady trickle of people, young and old, made their way towards the prayer site. Reveling in the rare moments of respite from the barrage of mortars that have recently pulverized much of the city, a multitude of men and women moved at aـ leisurely stroll while ecstatic children, blowing multicoloured balloons and whistles, trailed the footsteps of their parents, merrily frolicking on the streets. Their radiant faces displayed, for once, that long lost look of innocence, delight and happiness. To mark the occasion of Eid, thousands of Mogadishu residents made their way towards Maslax, a Siyad Barre-era military compound now occupied by Al-Shabab. 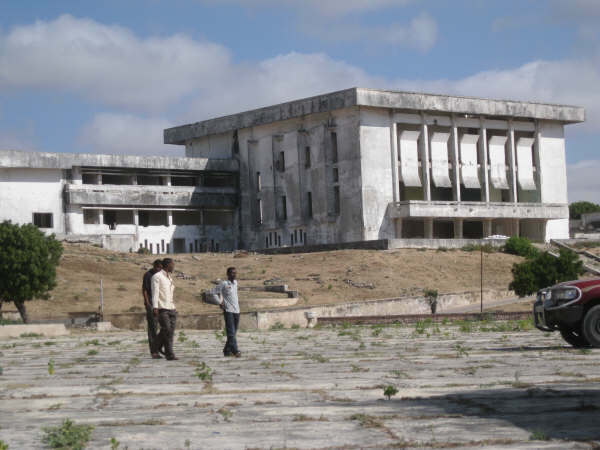 Though the stadium was the usual spot for Eid prayers, as it is large enough to accommodate the thousands of residents, it was abandoned in the last hour for fears that Amisom forces might shell the congregation in retaliation for the attack at the airport that killed several AU and government troops. 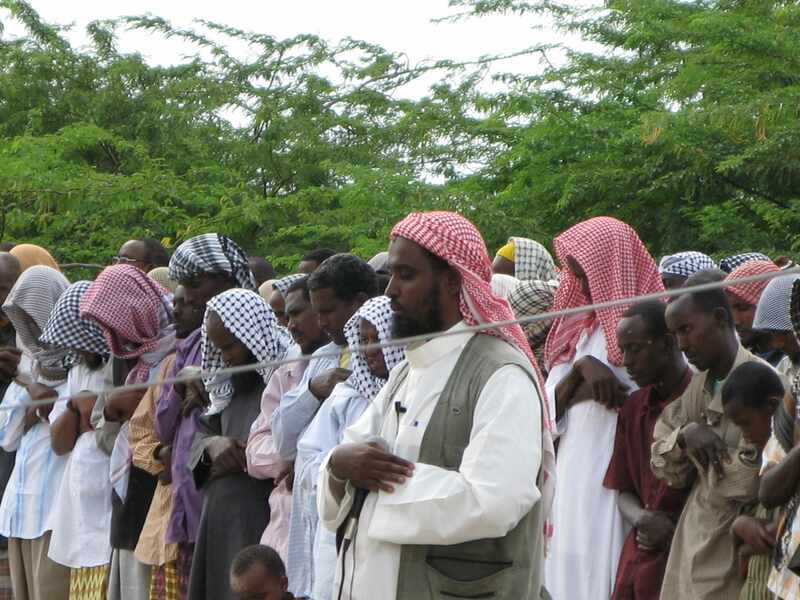 The Islamists, however, have organized several locations in and around Mogadishu to accommodate the influx of residents rushing to the congregational morning prayers that marked the end of the fasting season and the beginning of family reunions and splendid feasts. As I type this, a fierce battle is underway in the northern districts of Mogadishu. The rapid sound of machine guns and other firearms combined with the loud reverberations of tanks firing and mortars exploding can be heard from miles away. Since the beginning of Ramadan, there has been no respite from such daily battles, but as the month of fasting comes to an end, the battles here have become increasingly intense, particularly in the last few days. And with the ever changing formations of the battle lines and territorial boundaries that define the authority of the warring sides, the battle for Mogadishu, and eventually Somalia, has entered another new neighbourhood. After a series of co-ordinated attacks yesterday that targeted the Ugandan forces in the vital artery of Makka Al Mukarrama and Shangani district, the Burundi forces in Boondheere district as well as the Somali troops, the Islamists seem to be getting ever closer to achieving their goal. At around evening the loud sounds of heavy artillery fire echoed throughout the city and the sparks of fireworks glowing against the setting sun could be seen from every corer of the city. After several hours of the rapid exchange of bullets came the deadly silence. In this bullet-scarred city, where the gun wreaked havoc for nearly three decades, the sound of a gun has become a part and parcel of life. Silence, especially after a fierce battle, often signalled that something ominous was in the air. People immediately scampered to safety, and not before long, the mortars made their daily rounds, tearing apart the tin-roofed ramshackle buildings and huts. 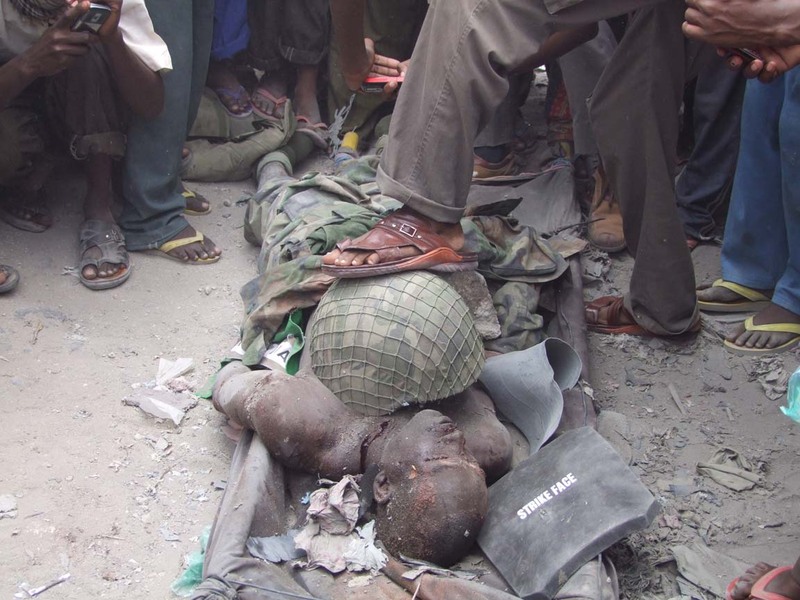 In response to the attack, Amisom began shelling the residents. Soon the news hit the airwaves that up to 23 people were killed and dozens more injured. And though up to 230 are reported dead this month alone and more than 400 injured, the numbers are far greater than that. Estimates here are at around 500 killed and more than a thousand injured. You would never imagine the serenity that surrounds the beautiful Mogadishu skyline in the early hour of the morning. 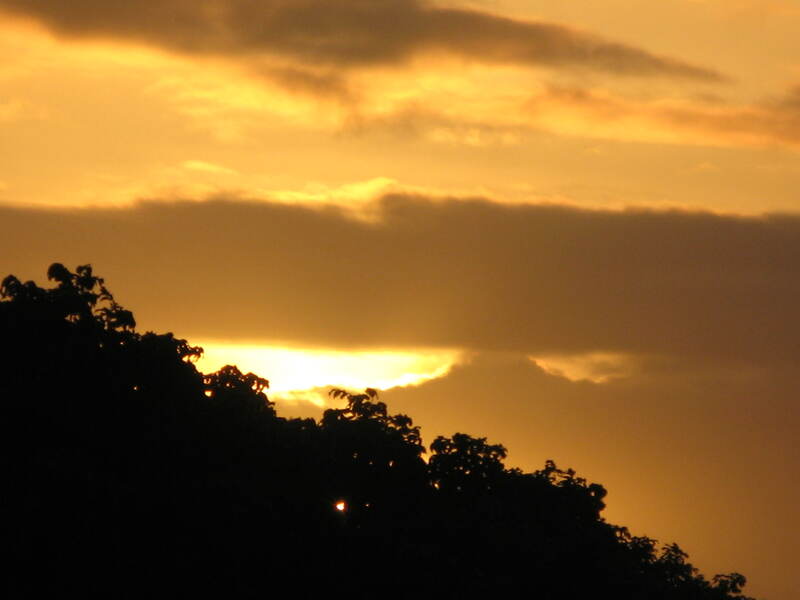 Standing at the balcony this morning and watching the rays of the rising sun shimmer across the great blue ocean, plunged me into a reverie that looked, well, more presumption than a possibility. There was no rattle of gunfire in the background or the sounds of mortars landing or even the clamour of voices in the crowded streets of Mogadishu. 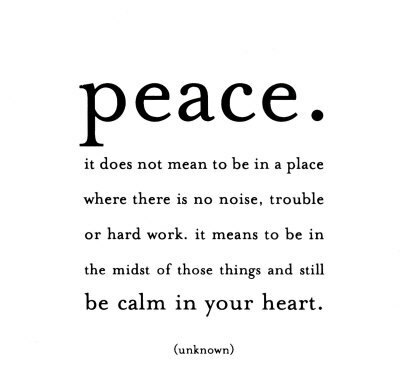 Everything seemed peaceful and calm; a feeling that is hard to come by in this part of the world. A gentle breeze whistled through the silent streets, playfully breathing life into the old cardboard boxes and plastic bags lying around in the dust. Even the melodious notes of the chirruping birds seemed to be quite in harmony with the tranquil setting for once. Amid the stillness of the surrounding, the loud clanking of metal coming from a shop across the street immediately distracted me. A young shop owner was receiving a delivery of some stock. Three sturdy men unloaded the goods and carried them on their backs and stacked them inside the shop where the owner had instructed them. For a while it was somewhat pleasant to watch their neatly choreographed movements in the way they organised and unloaded the goods. They’ve nearly emptied the truck when another car, a Toyota 4×4, zoomed in from the distance, horns blaring. The delivery truck was blocking the road and the three men hurriedly tried to unload the last few remaining items in order to clear the road for the approaching car. But they couldn’t manage that in time. The car, which was driving at quite a speed, soon approached and forcefully hit the brakes at the delivery point, still beeping the horn. 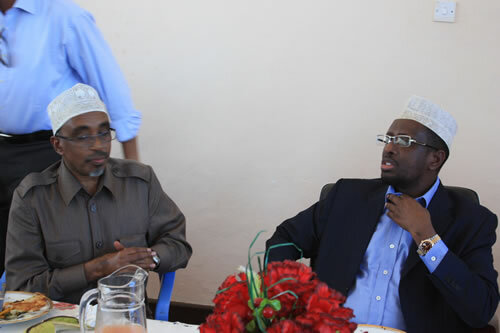 The battle for hearts and minds in Somalia has long been fought and won on the basis of tribe and tribal allegiances. But with the rapidly changing political landscape, particularly here in Southern Somalia, a recent shift in perspective has had a tremendous effect on the Somali population. Today the battle of hearts and mind is fought and won on the basis of religion and the people of Somalia judge the worth of an administration by what it can do to alleviate the suffering of the population or by the number of services they can provide the public; and here there is a great divide. In the congested streets of the Bakara market, an unusual event took place today. Al-Shabab, the Islamist force waging a bitter battle against the Western-backed Transitional federal Government (TFG), have launched a new ambulance service to help those injured by the bullets and mortars. 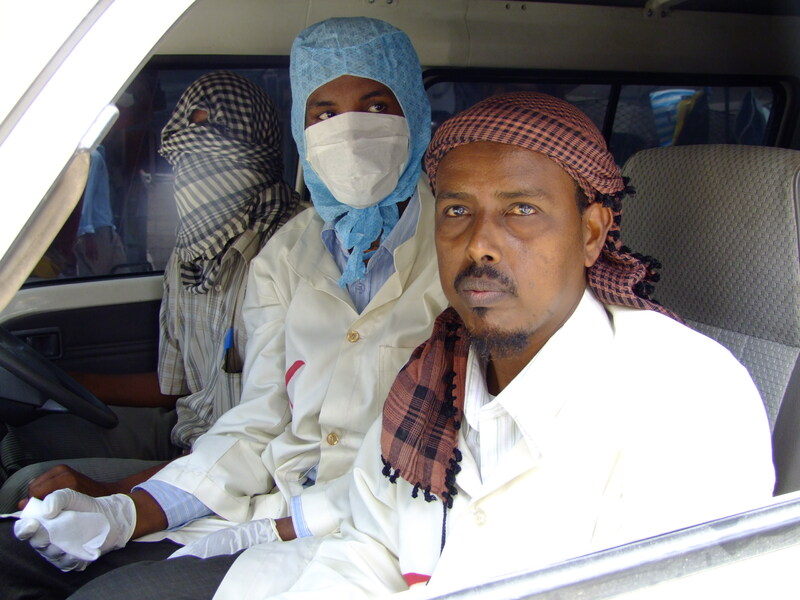 It is out of the ordinary of a group labelled a ‘terrorist organisation’ to set up an ambulance service, But Al-Shabab seem to be defying the norm. The menacing sound of rockets whistled past my window and exploded, a few seconds later, with a thunderous noise. It is a common occurrence here in Mogadishu. Every day dozens of rockets and mortars claim the lives of innocent civilians living in areas often far away from the battle fronts. Despite living in a hotel protected by large slabs of concrete, the power of the explosion threw me to the ground. Soon the pervasive smell of gunpowder filled the corridors of the hotel. It was a harrowing experience, and though I had expected my journey to be very dangerous, the moment of explosion completely dismantled my determination. For a while the whistling sound continued, as I lay flat on the ground, followed shortly by large explosions. Once the hailstorm had subsided and things appeared normal again, I went out in response to the neighbour’s loud bellows of rage. Outside the shattered tin-roofed house, Amina Hussein, a nurse at the local clinic, screamed her lungs out. Rummaging through the debris and gesticulating wildly, Amina had to be restrained by a group of women standing nearby. And as the crowd consoled the grief-stricken nurse, I peered into the destroyed house. Through the ruins, and illuminated by the sun’s rays seeping through the small openings, I was confronted by a horrific scene. Digging through the rubble along with some helpers, we quickly uncovered the four bodies. The nurse’s husband and three children, lying peacefully next to each other, were all covered in blood. Dressed in what seemed like a colourfully embroidered frock, the state of the youngest daughter, no more than five years of age, was perhaps the most shocking. Shrapnel had completely punctured her delicate body while blood slowly trickled out of her beautiful face. Mogadishu is under attack. Dozens of BM rockets, as they are called here, fired by the AMISOM forces have crippled the busy Bakara market and brought the entire business hub of Mogadishu into a complete standstill. Just as worshipers exited the mosques, after noon prayer today, the rockets fell. Hundreds of people in the market scrambled for safety, some hiding under concrete buildings and others rushing back into the mosques. I had just left my apartment and decided to meet a journalist, Keyse, for lunch when the shelling began. Squeezing through the riotous crowds of shoppers, hawkers, tea ladies and past the tightly crammed stalls whose fetid odour assaulted our senses, medicine shops and juice bars, we made our way to Tawakkal Restaurant, a fairly clean and quiet place compared to the other noisy eating places in Bakara. But just before we could enter the restaurant, the sound of a rocket fired caught Keyse’s attention. Being still fairly new to this war-torn city, my senses were not quite alert yet, though I am now slowly becoming attuned to the music of mortars. The frenzied look on my friend’s face explained it all. Without a second spared, we dashed into the nearest building, hurdling past donkey carts, screaming kids and stumbling women. Though it becomes the natural instinct to help the elderly and the weak when in need, but during times like these, and in Mogadishu’s mayhem, it is every man for his own. Several rockets, whose whistling noise was enough to send fear running through your veins, fell a few streets away from where we were. 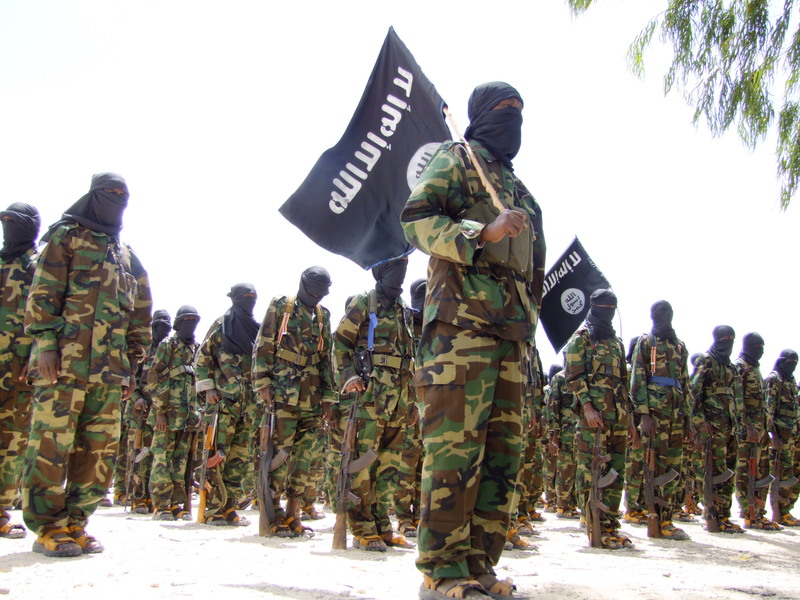 Al-Shabaab has banned the BBC from operating in Southern Somalia. In a press release read out this morning here in Mogadishu, the Islamic Administrations in Mogadishu, Marka, Kismayo, Jowhar and Bidoa have taken all of BBC’s FM transmitters off the air and seized all their property. The statement described the organisation as a ‘vile western mouthpiece’ propagating ‘a barrage of depraved Western views’ to the unsuspecting Muslim population. The air seems somewhat strange and silent here in Mogadishu. The renowned BBC tone is no longer on the radios and the public is buzzing with discussion and debate. HornAfrik radio which used to air the Somali Service apologised to the public on newshour. Al-Shabaab have also issued an order to HornAfrik, the only radio station that airs VOA news, to stop airing its programs. Al-Shabaab’s daring display of authority comes at a time when majority of the Somali listeners have been expressing great concerns about the BBC’s management and editorial content. The BBC Somali Service has been riddled with complaints from the Somali media and the public alike. Al-Shabaab, which has been banned as an organisation in Britain has struck back fiercely and banned the BBC, accusing it of inaccuracy, impartiality, lack of objectivity, propagation of Western views and fanning the flames of enmity among the Somali population. Some of these accusations, however, are coming not only from the Islamists but some professional and journalists have also voiced somewhat similar opinions.